Here are some fun and interesting tips and tidbits about pipe chimes and things that might help you better use or make your own set. 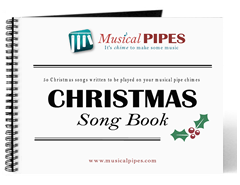 You can also read more information about how to play your handheld pipe chimes. If younger kids are playing that don’t quite know their letter yet, place beans, candy or cutout colored pieces of paper over the numbers you would like them to play so they can more easily spot their turns to hit their chime. 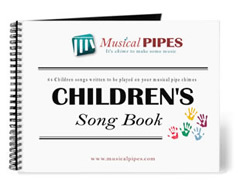 Give younger kids the notes that are not used very often (notes marked with an “*” in our song books indicate that chime is only used less than 5 times). Use a conductor if everyone can’t follow along on their own. The conductor will simply point to the next note in the song. 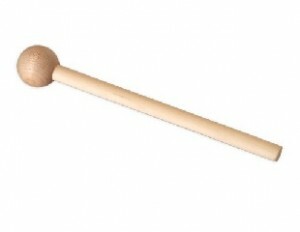 For a softer and quieter sounding tone, strike your chimes with a wooden object (instead of metal) such as a wooden dowel or our wooden mallets. Resist the urge to strike your chime harder than you need to. This will make the chime swing and make it difficult to hit notes that are played right after each other. Sharp quick strikes are best. If you want to play a song that uses more chimes than what you have people, double up and test your attention skills. You can either get two chimes that are close together (#10 and #12) so they are more likely to be played in sequence or double up on chimes that are far apart (#5 and #15) to avoid the previous situation. Which ever works best for you. Make sure not to touch your chime while you are striking it – this will create a dull sound and won’t match the other chimes. If for some reason, the song you are playing isn’t in the right key signature, simply shift all the numbers in the song up or down according to where you need the song to be played. This is helpful if you can’t hit the highest or lowest chimes (not in your set). 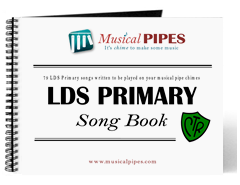 For easier viewing, after purchasing your own pipe chime song book, you may want to print it out on 11 X 17 to allow more people to see it from farther away. For small groups or for even playing by yourself, use our custom made cradle holders to play your pipe chimes like a xylophone. If you really want to simplify things for one person to play by themselves, take away all the chimes not used in the current song and only place the used chimes in the cradle holders. Cradle holders should be placed underneath the chimes about where the holes are located for the strings on the top. The bottom cradle holders should match approximately the same distance from the bottom of the chimes as the top. 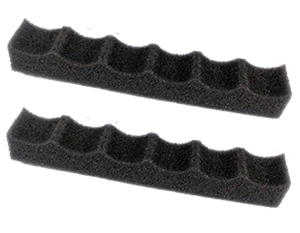 To partially mute your xylophone, pull the cradle holders closer to the edges of the chimes in minimize the vibration and sustentation of each note. For larger groups, it might be easier to hand out all the chimes, one to each person. That way everyone will keep the same chime number (for the most part) and everyone will get an even and random chance at playing. To make things more interesting, after every song, hand your chime to the person to your right. This will help make sure everyone gets a chance to play. If you’re pipe chimes sound slightly out of tune, keep in mind that temperature could alter the pitch of the note. Metal expands (when warm) and contracts (when cold) causing the chime to sound slightly flat or sharp respectively. For advanced pipe chime players and the more musically motivated, you can make your own harmonys by playing two or even three chimes at once making chords. Timing and proper harmony selection are key on this one.